The Model 350WB (AC current) Vibratone® horn produces sound by the electromechanical vibration of a stainless steel diaphragm. The horn mechanism with diaphragm is attached to the grille. Indoor or outdoor use is made possible by the water and dusttight backbox. The 350WB is available in 120 or 240VAC for 50/60Hz. The sound output level is 100dB nominal at ten feet (110dB @ 1m). These Federal Signal horns accommodate surface, flush or semiflush mounting on walls, panels, in cabinets. Model 350WB features a diecast zinc housing sealed with a gray enamel finish. The rugged outer housing resists vandalism without reducing sound output. Model 350WB is fused and utilizes a terminal block connection. The horn and backbox combination is UL and cUL Listed (Underwriters Laboratories), CSA (Canadian Standards Association) Certified and FM Approved. 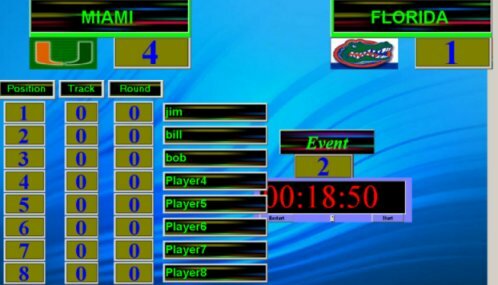 Our projection scoreboard uses special software, a unique projection system with our design projection screen.